Instant Shade has been in operation since 1980. 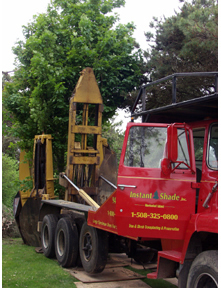 Throughout the 1980s we specialized in tree pruning and care, moving plants by hand in those early years. We purchased our first tree spade in 1989, at which time we traveled all over Massachusetts, Connecticut, New Hampshire and Rhode Island moving up to 12 inch caliper trees and selling plants to estates for screening and specimen needs. We did a great deal of work on Martha’s Vineyard and Nantucket and eventually moved to Nantucket in 1998. Today, based on Nantucket and New York, Instant Shade continues to service all of New England. Nantucket’s windblown environment can be inhospitable to off-island species, we have therefore become proficient in complete landscape projects: planting and transplanting all native plants. We collect and purchase shrubs and trees, and bring them back to our nursery or directly transplant them to their new homes. There is a great need for saving plants on Nantucket and acrross the country whenever possible and more education is necessary to make the public aware. The mainland offers a different set of challenges. 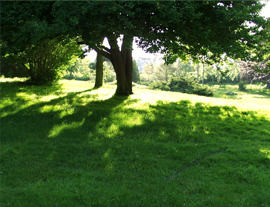 The finding and placement of mature specimen trees for future years of enjoyment. Many times the proper placement and variety of trees has brought astounding results completly transforming house and property. This brings not only incredible fullfillment to both parties but can dramitcally increase property value as well.